The New Windsor Hotel began it's life in downtown Phoenix as the 6th Avenue Hotel back in 1893 right after the territorial capital was moved to Phoenix. 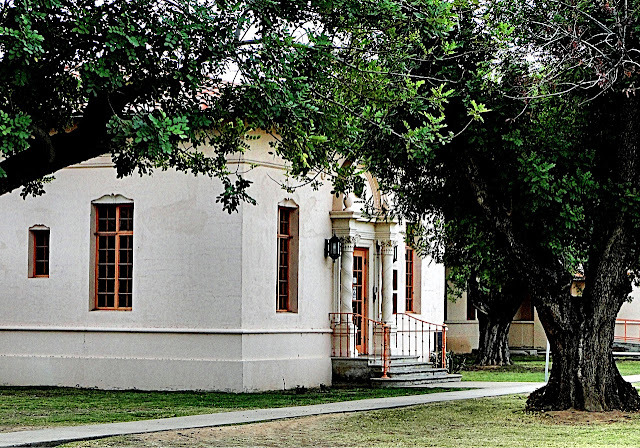 It started it's life as a two-story brick building. 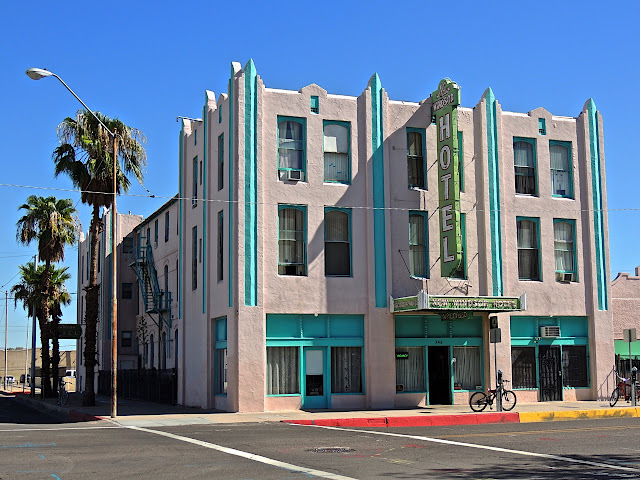 In 1925 the name changed to the Windsor Hotel and during the 1930's it underwent a big remodeling project where a third floor was added and the new 'modern' stucco finish was added. It is the only 19th century hotel in Phoenix that is still in use today however it's not used as a public hotel any longer. Today it serves as housing for the low-income elderly. This big and very round tree caught my eye recently so I decided to stop to get a photo. 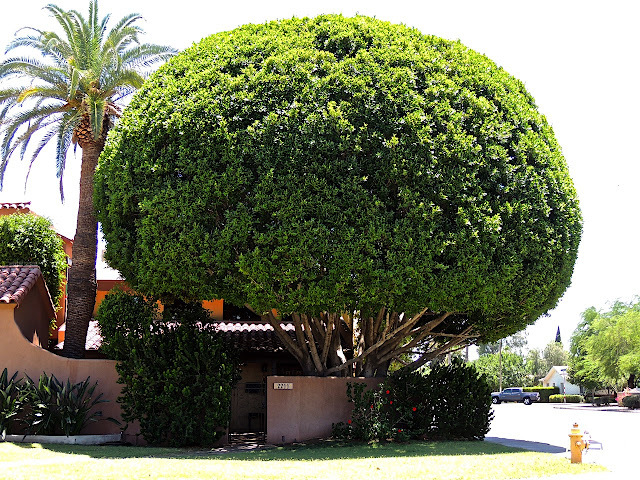 I'm sure the owners must have it trimmed to keep that lovely round shape. This view shows the house it belongs to This is in one of our historic neighborhoods, so this house was probably built some time in the 1940's. Sitting just inside the grounds of the Phoenician, one of our premier resorts on the border between Phoenix and Scottsdale, is The Jokake Inn welcoming guests with its decidedly southwestern appearance. 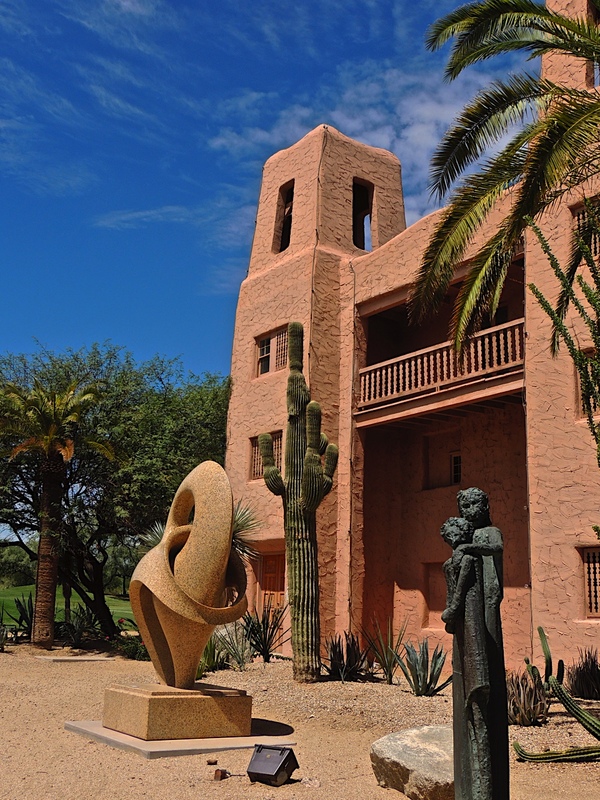 Back in the very early 1900's, 40 acres of property at the base of Camelback Mountain was owned by the artist Jessie Benton Evans. She gave 12 acres of the property to her son and daughter-in-law and they built this very unique adobe house. It was expanded over the following years to accommodate guests. A young Hopi Indian boy gave the home its name "Jokake" which translates to "mud house". 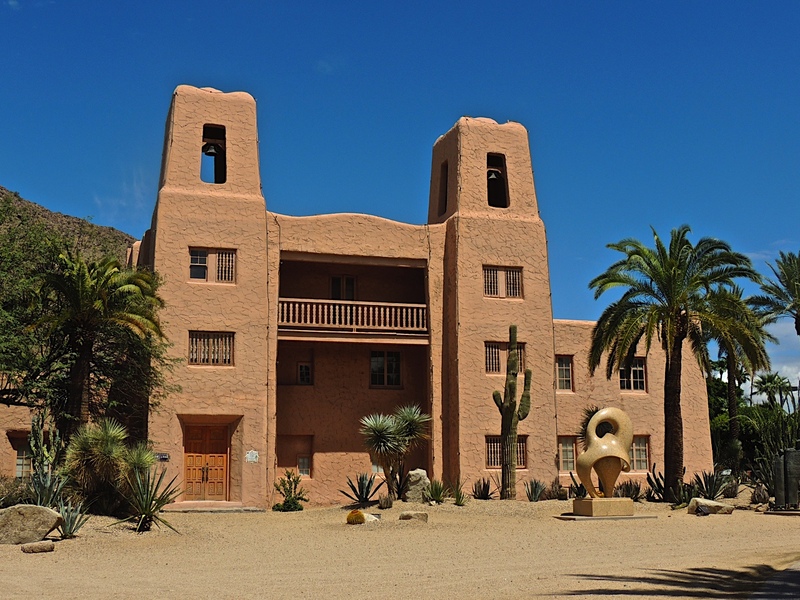 Today the building is used every now and then by The Phoenician to host small gatherings or parties. 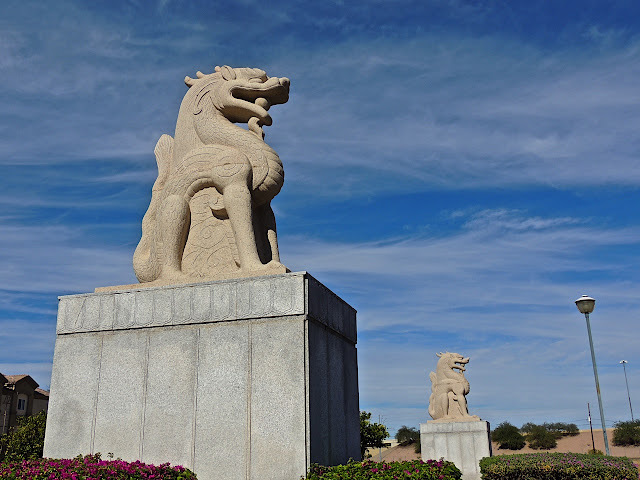 Other than that, it stands there proudly just inside the entrance drive. 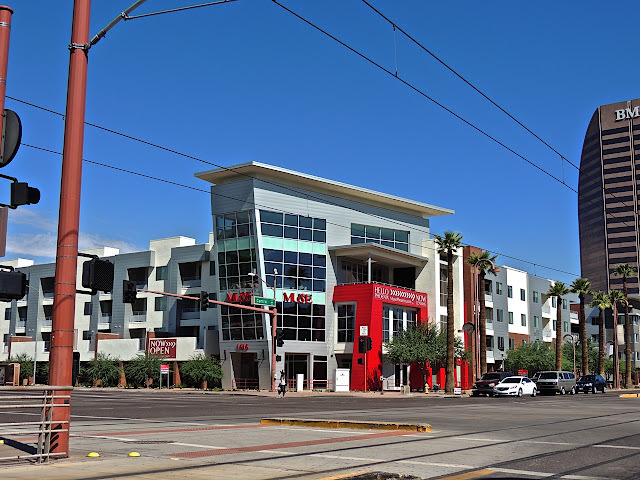 There are some brand new apartments that have just opened right across the street from the Phoenix Art Museum. They are called "Muse". A few years ago I served on the Encanto Village Planning board for my old neighborhood and I remember when this apartment plan came before the board. It was supposed to have a work/living feature with businesses on the ground floor and apartments above. I'm going to have to take a closer look at this place to see if it turned out that way. 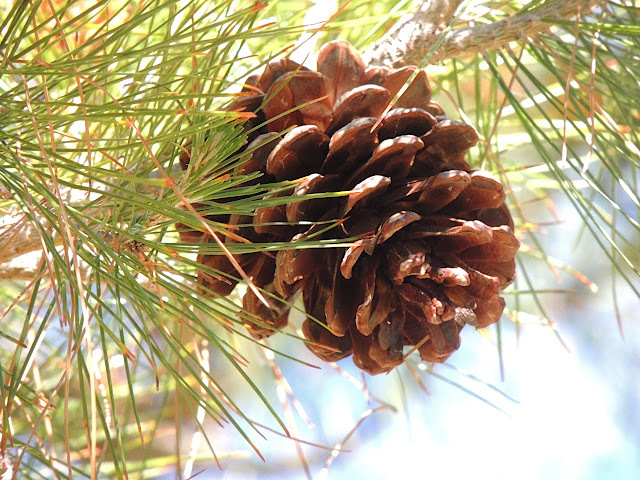 I did make it outdoors on Sunday to take advantage of the gorgeous weather and to do a little communing with nature. 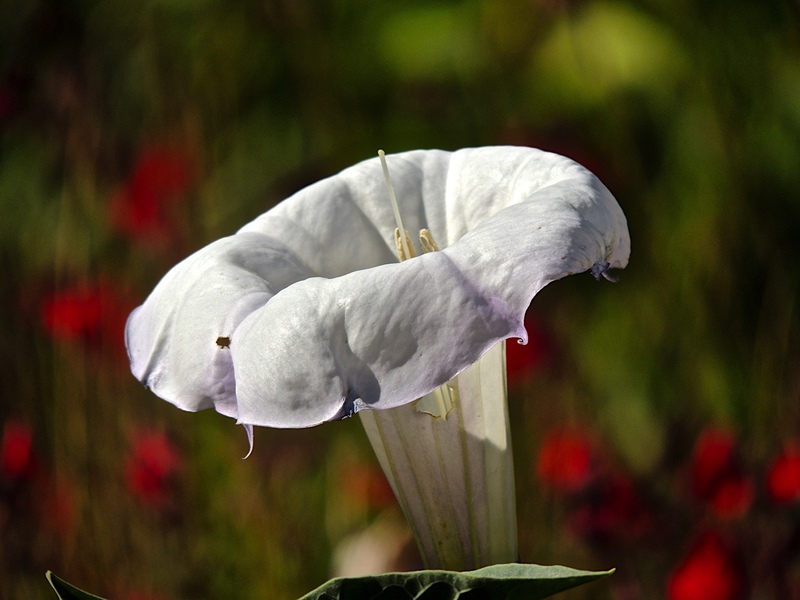 I took a long walk at the Desert Botanical Garden where I found this lovely white datura bloom. It's looking pretty good with those splotches of red flowers behind it. 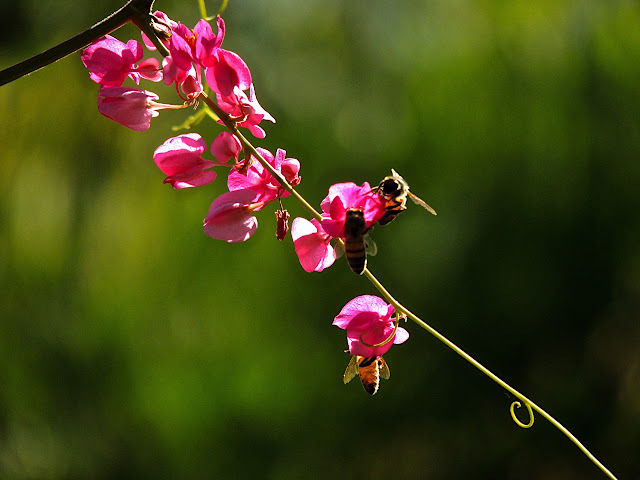 The honey bees were busy as usual. 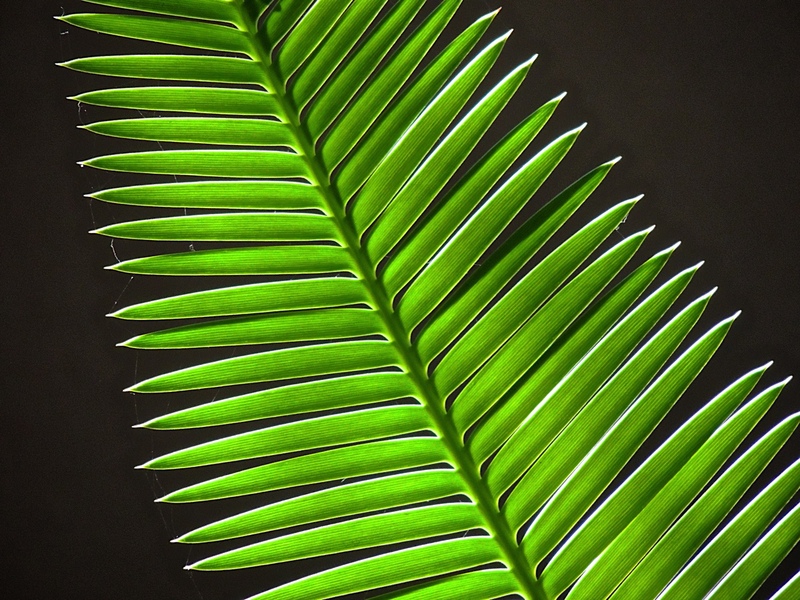 And the bright sun shining on this palm leaf was making it hard to resist. 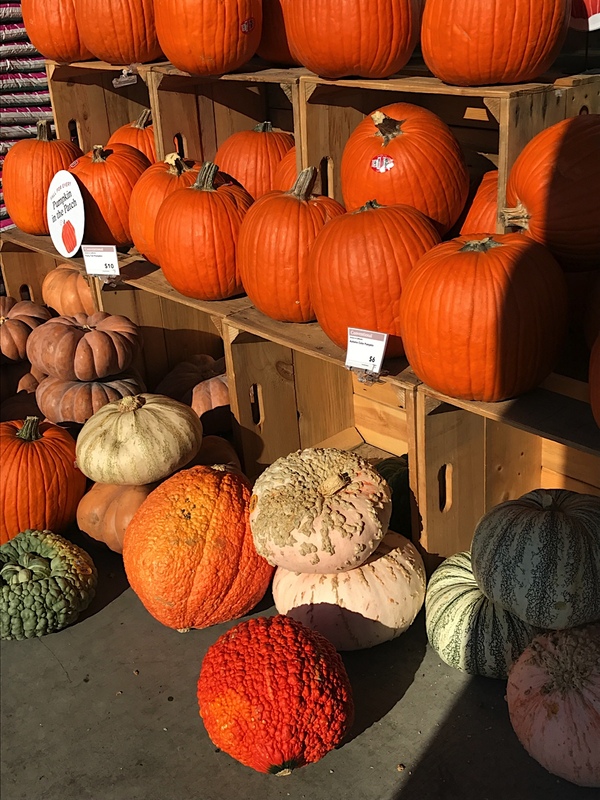 I was hoping we were headed into fall weather but, the reports say it's heating up again later this week. 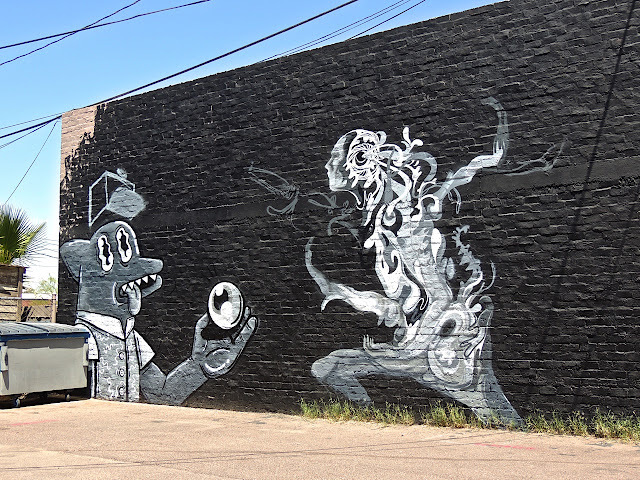 Back in 2012, I posted about a brand new mural that had been painted near downtown Phoenix in an area that has become a vibrant arts district. It was of three birds and I loved that mural. You can see that post here. 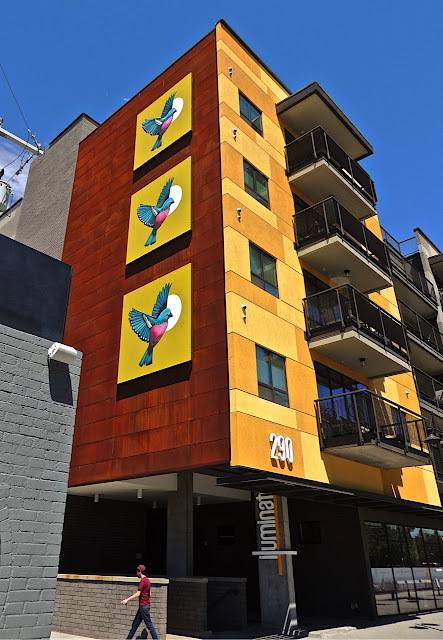 In 2015, the building where the mural was painted was demolished to make way for another apartment complex and it almost broke my heart when I heard that wonderful mural was gone. 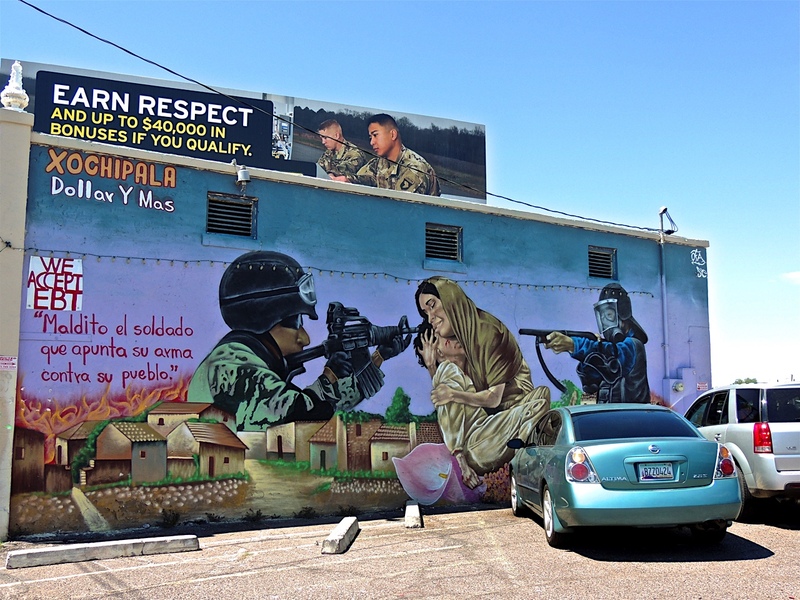 The original 2012 mural was the artist Lauren Lee's very first mural and the fact that it was demolished raised a lot of publicity and angst in the arts community. Well, fast forward a few years and those apartments are now done and I was pleased to see that Lauren Lee was commissioned to reproduce the birds in a new format. 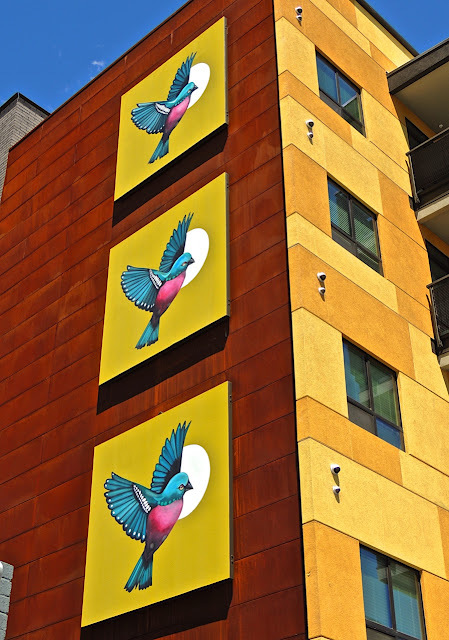 The new piece is called Three Birds in Flight and it was done in three panels that are now fixed to the wall of the apartment complex that replaced the original building. These are wonderful and I'm pleased that they are back where they belong but, I still like those original Three Birds the best. The artist loved them so much that she had them tattooed on her upper arm! It's a beautiful Sunday here in sunny Arizona and the temperatures have finally fallen to sane levels. In fact, it's predicted to reach only 87 degrees today and will start out in the low 70's. 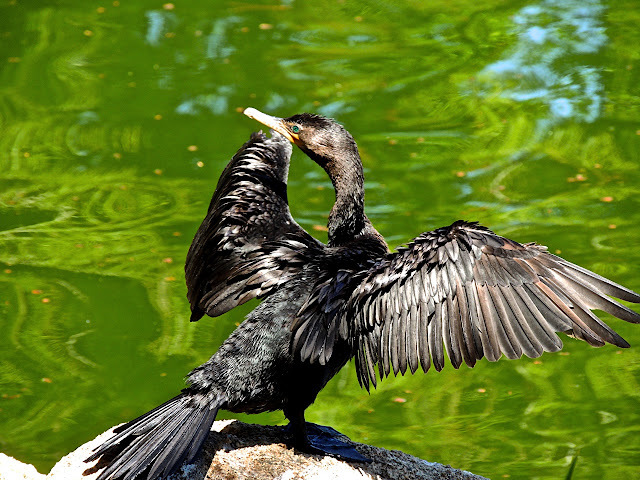 It's time for me to spread my wings and get out to experience some nature. You can bet I'll be taking a long walk today! 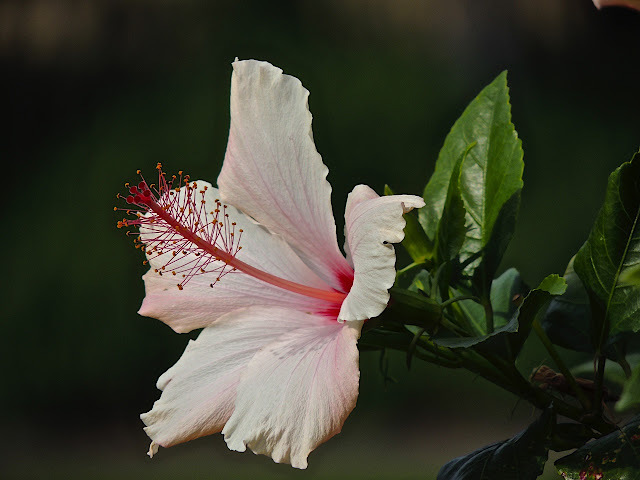 I have a new post on Sharon's Sojourns today. It's another Sunday outing but much further away. In the Market for Some Western Wear? Here are a couple of businesses in Old Town Scottsdale that have been around for a very long time. They both specialize in Western wear. 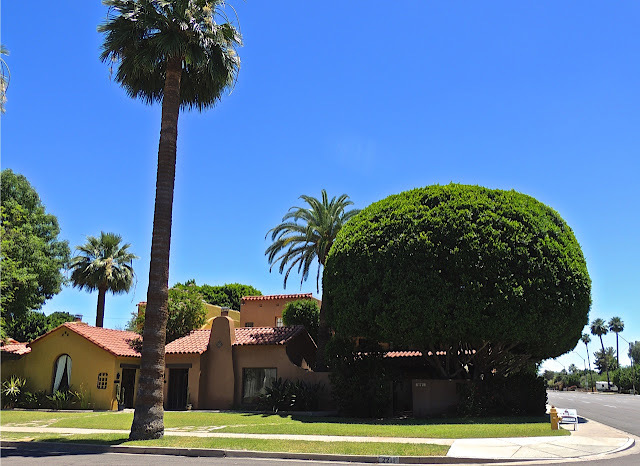 This location for Porter's was once the very first post office in Scottsdale. It's said that people would gather here and wait for the mail to arrive. That was back in 1929. 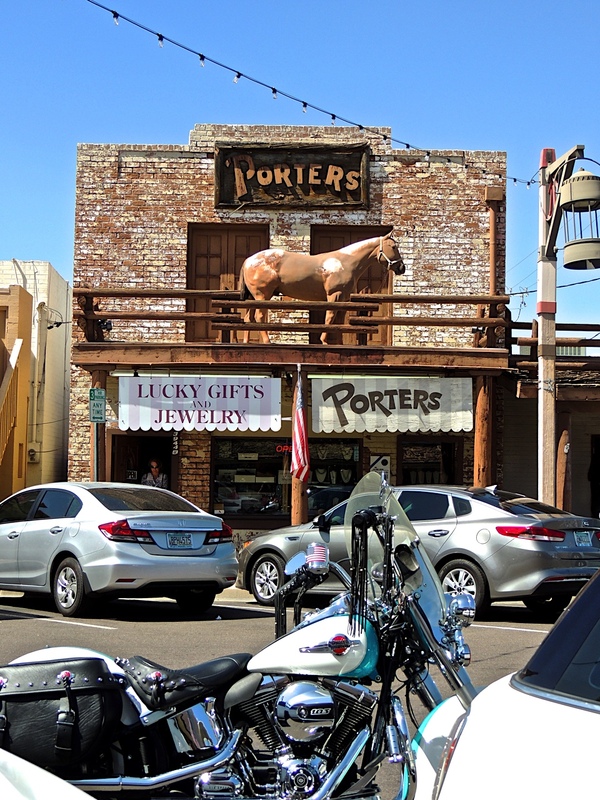 Now Porter's is known as the "Boot Corral". They sell lots of shoes but have a huge selection of boots. Just down the street from Porter's is Saba's Western Wear. It's been in business for 90 years. They opened their first store in 1927, back when many of their customers rode up on horseback. 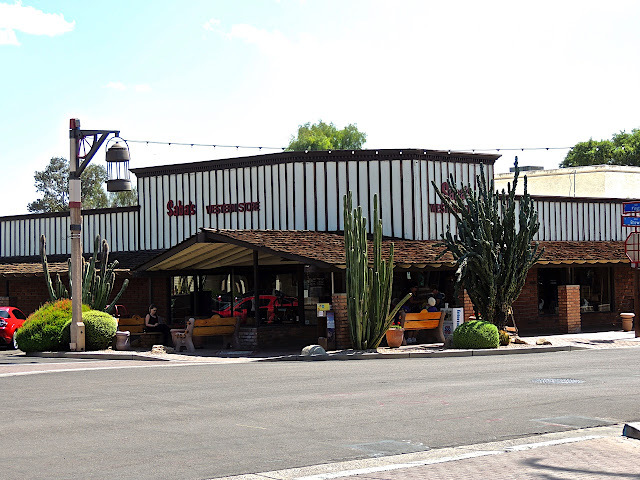 When I first moved to Arizona, there were several occasions that required one to wear western style clothes so I went to Saba's to find the right things. That was a very long time ago and although I haven't seen many people dressed up in western clothes these days, they still seem to be going strong. 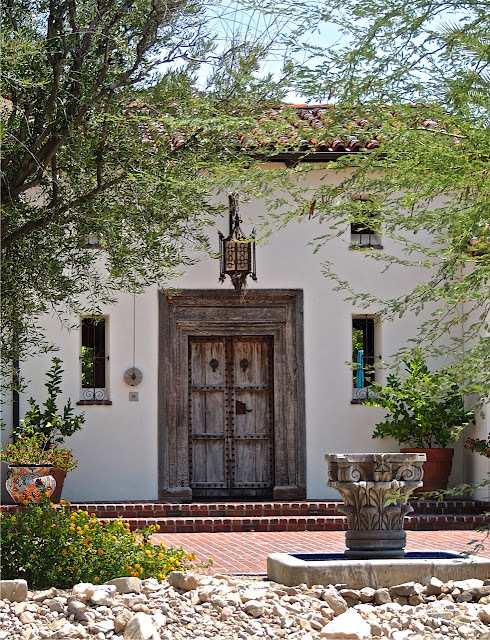 I'm always on the lookout for interesting doors and entrances and if I cruise around the hills of Paradise Valley, I'm bound to find some. 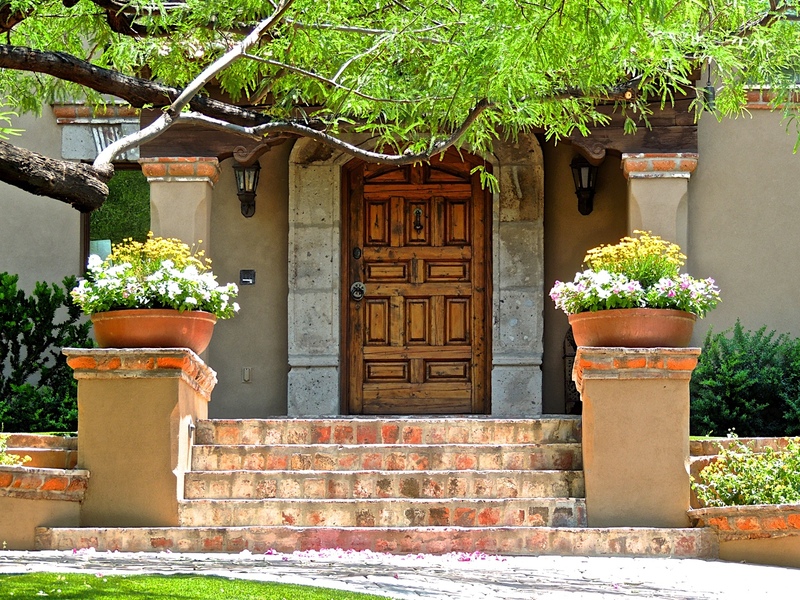 This one is rather elegant looking with the stairs and the planters. This one is very rustic and that light fixture overhead is the perfect addition. It has a very "old-west" look to it. 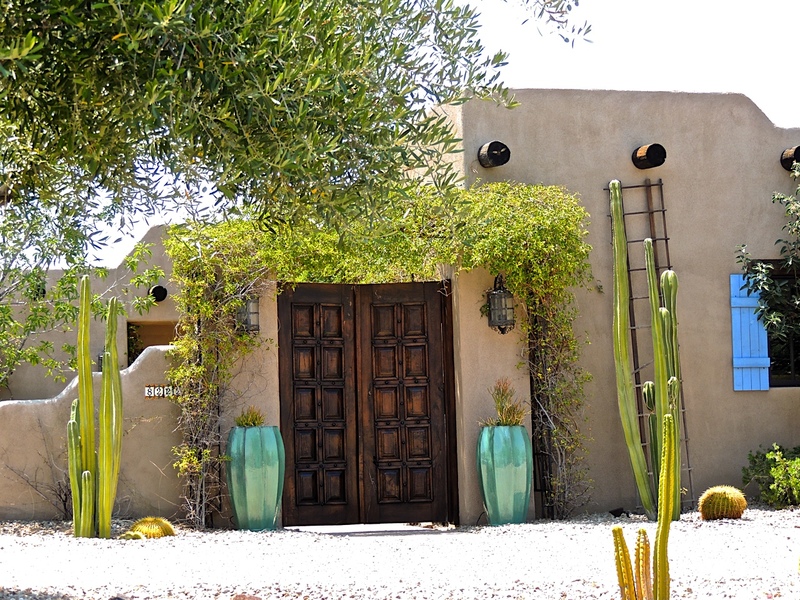 This one is decidedly southwestern in style and those cactus and the two large vases frame the double doors very nicely. Remember last month when I posted about the man in white standing in front of an apartment complex? And, then there was the time back in May when I posted about the lady holding the urinal who also sat in front of an apartment complex. Remember that one? Well, here is another one that I found not too far from the man in white and also sitting in front of an apartment complex in Tempe. One of my faithful readers, found the name of the artist and as luck would have it, a couple of weeks ago there was an article in the newspaper about that very same artist. His name is Bill Tonnesen and he's not only an artist but he is also the owner of the apartment complexes where his interesting works resides. 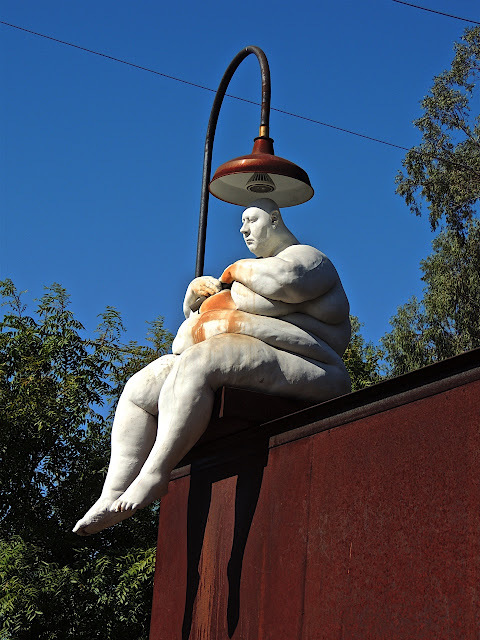 I visited his web site and discovered a few more of his pieces that reside around town. One of those pieces I posted a photo of way back in 2008. It's a piece located at a business so it doesn't get seen by many people. It you check his website, you will see photos of how he creates these figurative sculptures. 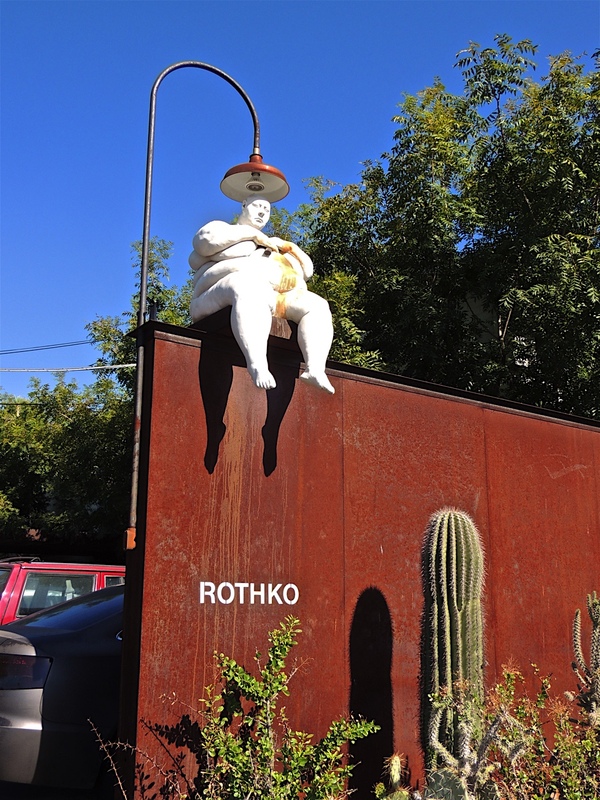 Besides the art, he also owns both business and residential properties and he's a landscape architect. I will seek out and show you some of those other pieces in the future. 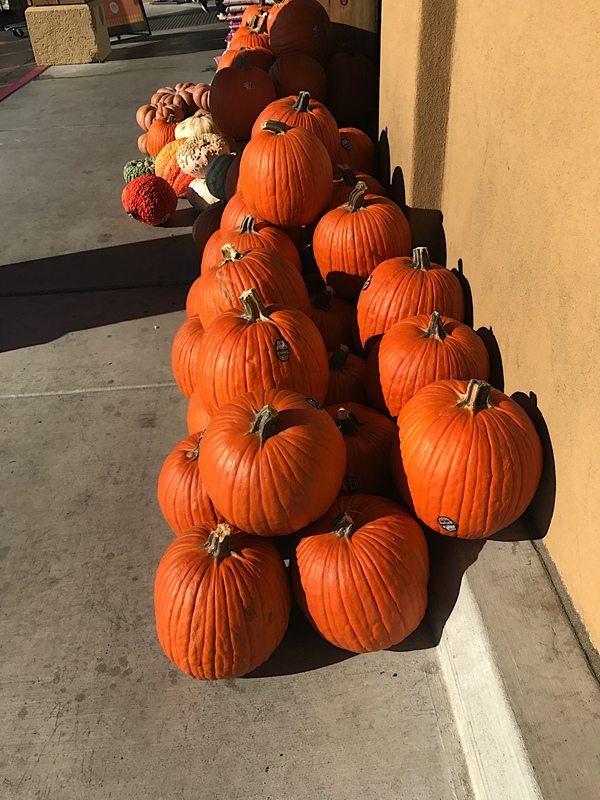 A sure sign that fall is in the air is when you see pumpkins stacked up outside the grocery store. Since temperatures are still hovering around the 100 degree mark, sometimes we desert dwellers need a sign like this to let us know. I found this batch of pumpkins and other squash outside my Whole Foods Market this last weekend. Maybe the site of these beauties will make the air feel cooler. The last time I visited the Chinese Cultural Center was way back in 2009 so a few months ago, I decided to stop and take a look around. I was shocked that so many of the businesses had closed. 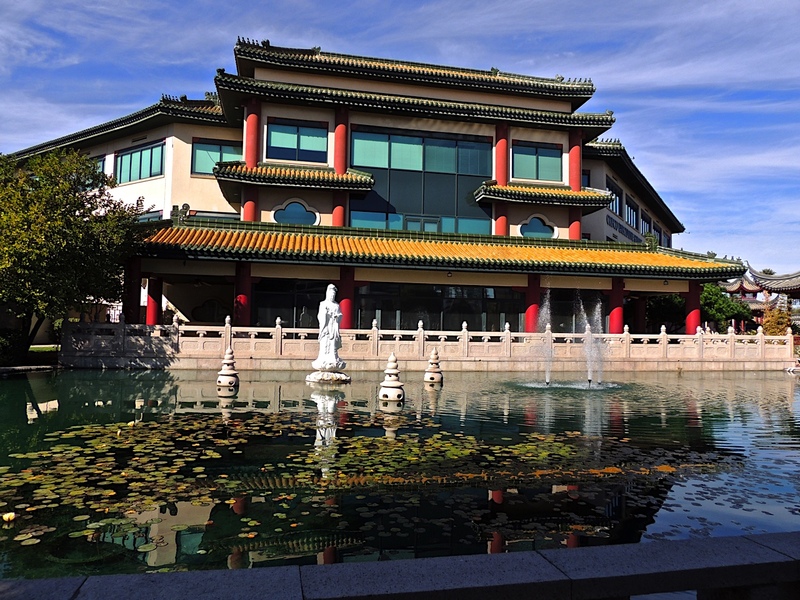 Recently I heard on the news that the property was sold to True North Corporation and they had plans to remodel and convert to a business center and corporate headquarters. That news has come as a shock to the Asian community who don't want to lose the center's gardens and cultural aesthetics. The last I've heard about what is happening was back in August when a news report said that the new owner and the Arizona Asian Alliance were trying to negotiate a compromise. It certainly would be a shame to lose such an iconic center and it's beautiful architecture. I do hope they can work something out. There used to be an Asian grocery store on the site that had a wonderful selection of Asian foods that you couldn't purchase anywhere else. It looks to me like the character on the left has conjured up more than he bargained for when he looked into his crystal ball. At least that's what I'm seeing in this mural. I didn't see a signature on this one so I can't tell you who the artist is. My "Art Challenge" group had a very special event last Friday night. 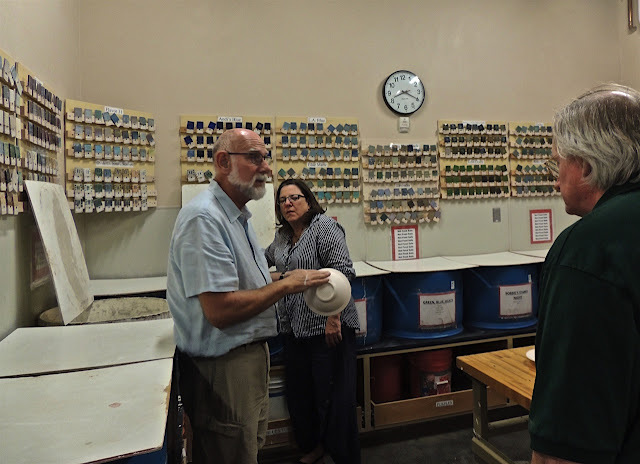 One of our members, Ted Wolter is an art teacher at the Chandler-Gilbert Community College and he treated us to a very special ceramics class. 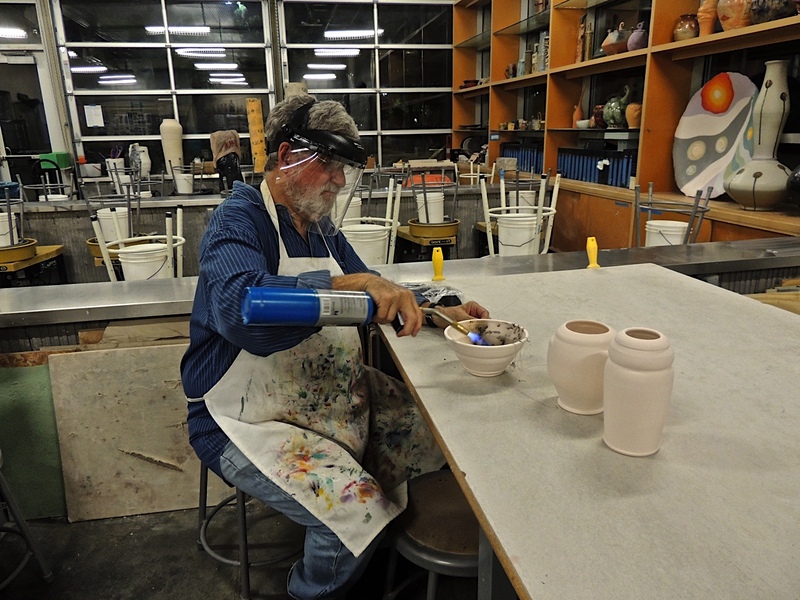 That's Ted above showing us how apply the glazes to our chosen pieces. Ted created a variety of pieces for us and we each chose as many as we wanted to tackle and learned to apply the glaze. Those blue, barrel-like containers contained the different glazes and the sample pieces on the wall gave us an idea of what they would look like when fired. 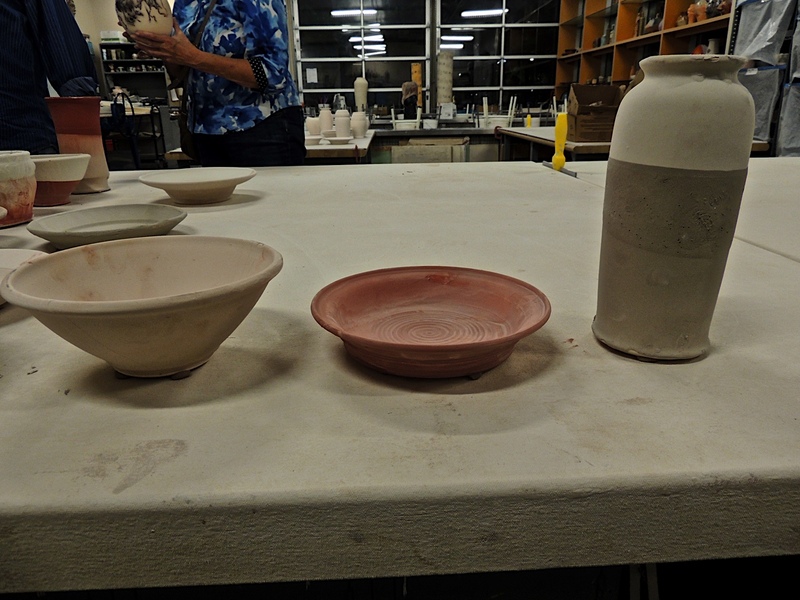 These are my three pieces with the glaze applied. What was interesting is that once they have been fired they won't look anything like they look right now. My vase should turn out blue. I promise I'll show you the end result once I get them back. I can't wait to see how they turn out. Jim Lowman has had some previous experience working with ceramics so he took this opportunity to try something new for his pieces. He was burning strands of horse hair into his pieces. It creates black, spidery lines. I have a new post on Sharon's Sojourns today. 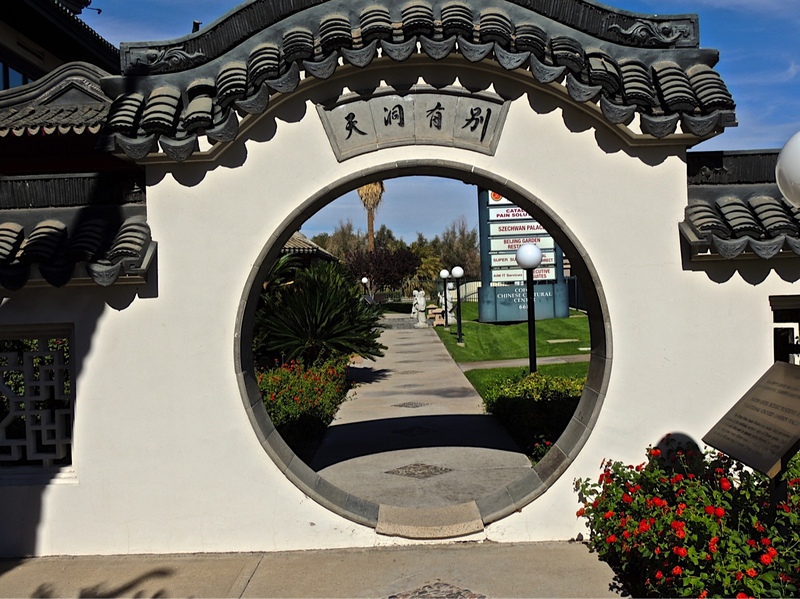 I'm visiting the oldest neighborhood in California. 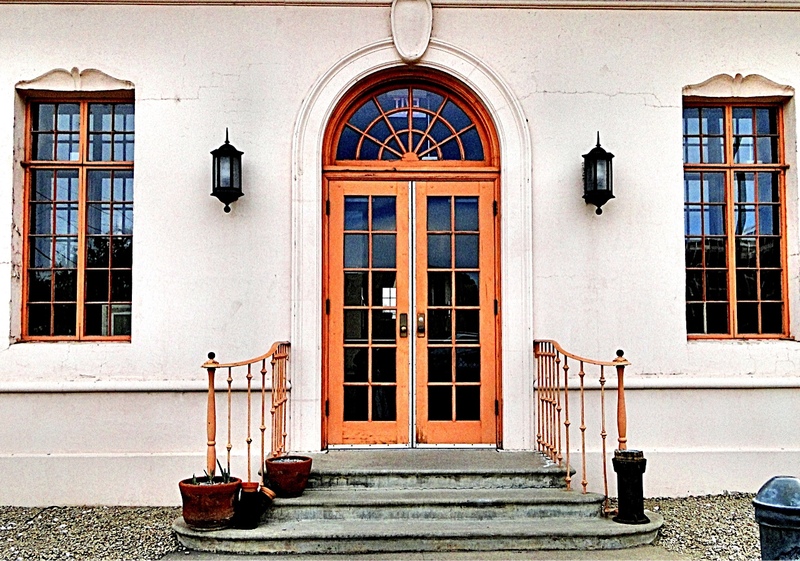 Whenever I pass by this building I'm always attracted by those pretty doors with the window above them. I finally stopped to take a photo. I'm not sure what this building is used for. 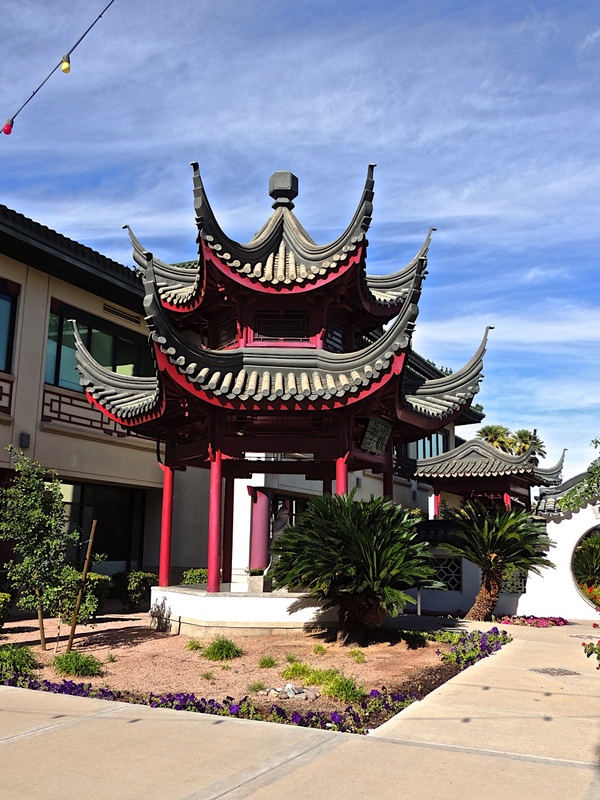 It's part of the Phoenix Indian Medical Center. The actual medical building is a tall, modern structure but, this building sits near by on the same property. It's probably used as offices but there were no signs to let me know that. It's obviously a much older building but it has been carefully preserved which is always nice to see. I saw this photo in my files and wondered why I had never posted it. 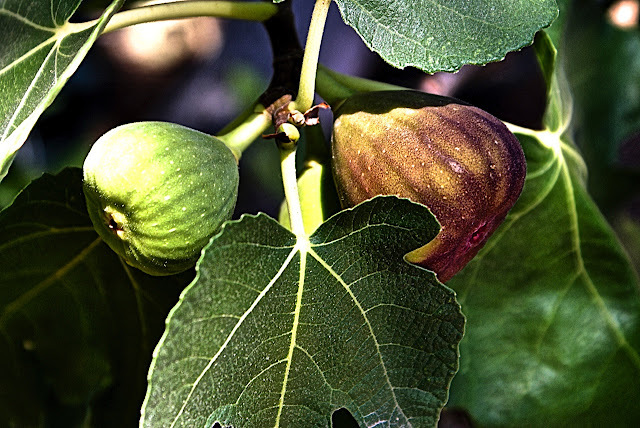 When I was living in the house on the other side of town I had a fig tree in the back yard along with several other trees. It was a big back yard! One year when I was there, it had an abundance of figs to harvest. If I could get to them before the birds did I could have fresh figs in salads and other dishes. There are lots of things about that house and the huge yard that I miss but, I'm still happy that I downsized. 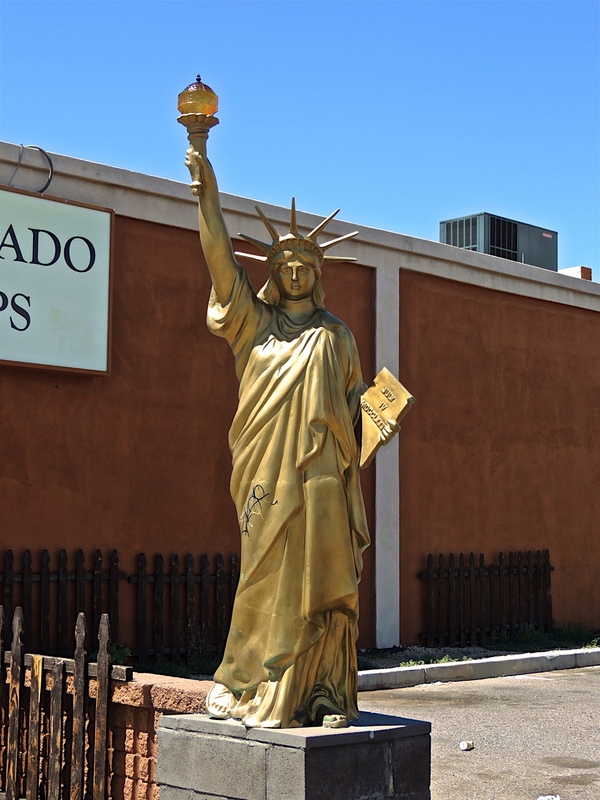 I've passed by this row of shops several times and have wanted to stop and get a photo of this golden Statue of Liberty. When I finally stopped one day, a few other things here caught my eye. One of them was the sections of old picket fencing leaning against the shop wall. They have a rustic look to them. 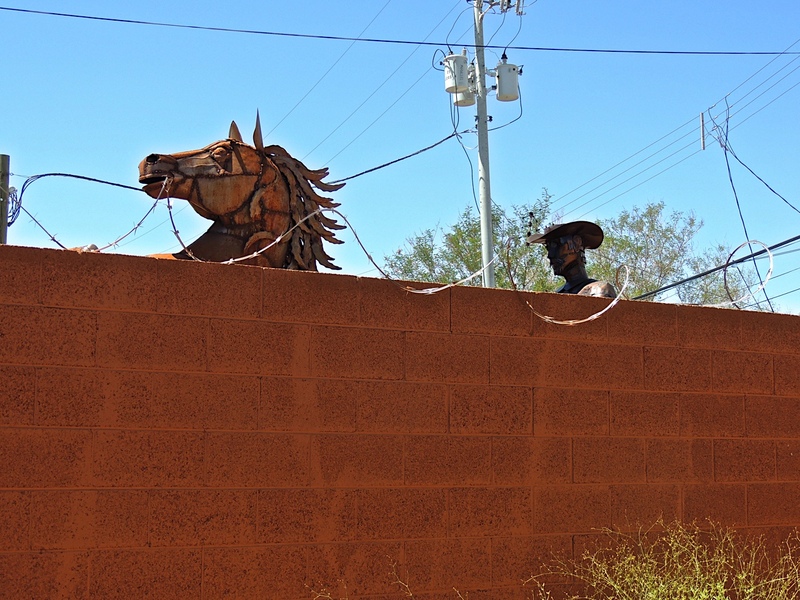 The other thing that caught my eye was this horse and man peeking over the parking lot wall. I wonder if all that razor wire is to keep them from climbing over. 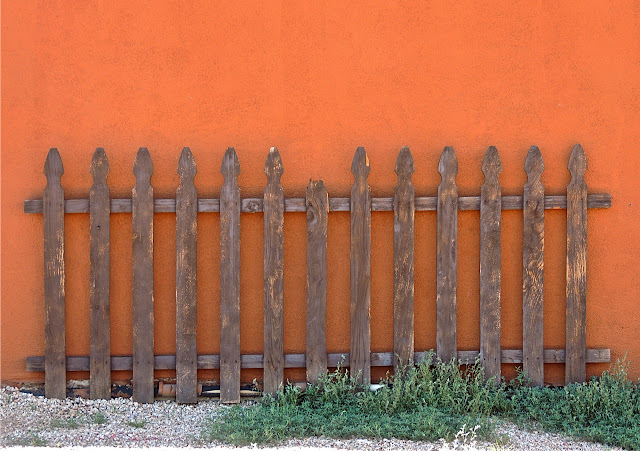 I guess it's more likely that it's there to keep people from climbing over the wall to see what else is back there. 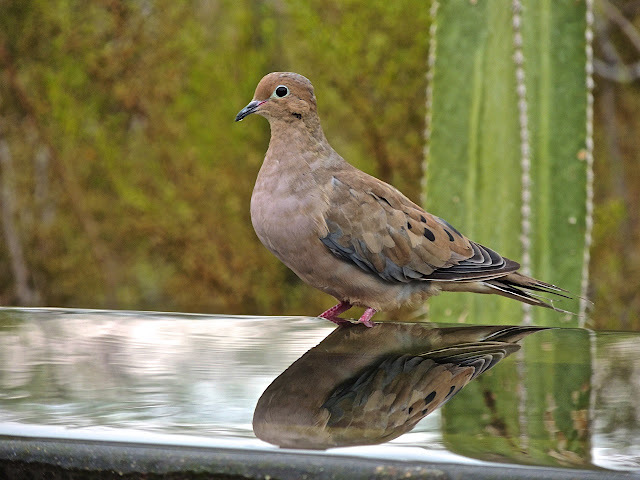 Before I went to the Farmer's Market last Saturday, I went for an early morning walk at the Desert Botanical Garden and I was happy to see lots of wildlife activity. 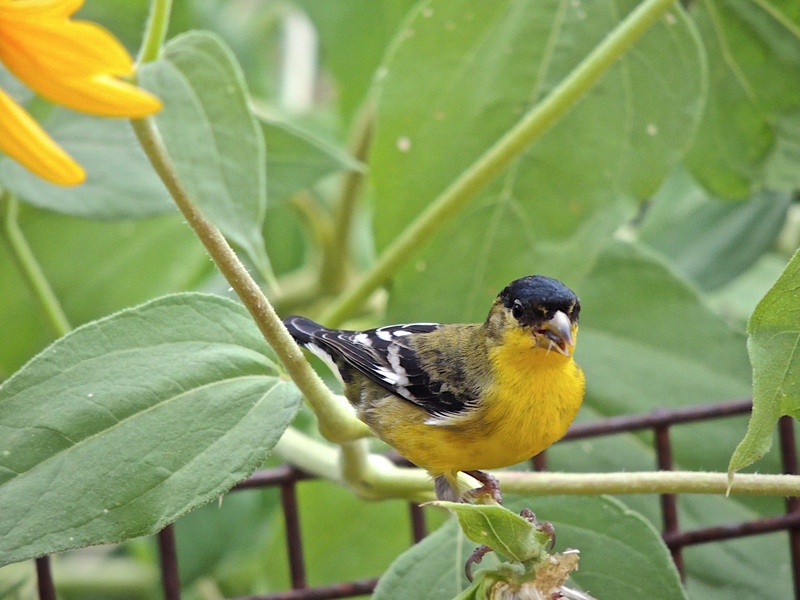 This goldfinch was picking the seeds from the center of a yellow flower. 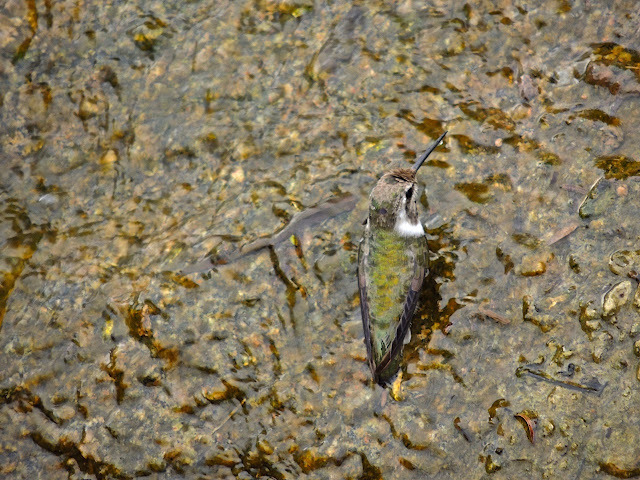 This hummingbird blended in so well with the wet rock he was sitting on that I almost missed him. This is a spot where water flows over a group of rocks and I think this little one was getting a drink. 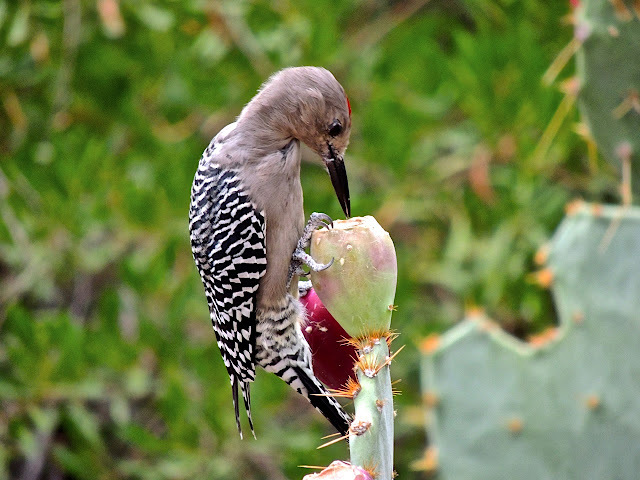 This woodpecker was attacking a prickly pear fruit. And this mourning dove stopped at the reflecting pool to get a drink of water. We had a bit of a storm roll through the valley Friday night leaving the temperature a tiny bit cooler on Saturday morning but, there was a catch. The humidity was much higher so it might have been cooler than usual but, it felt about the same. 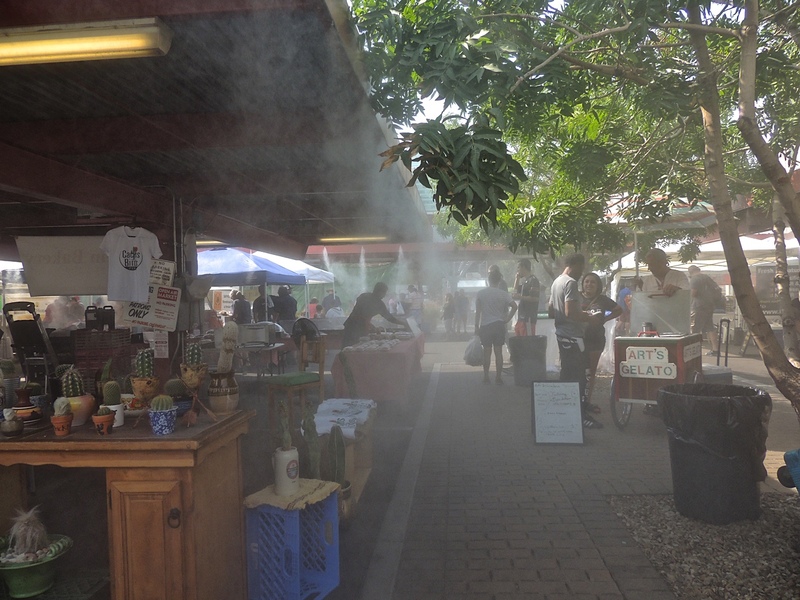 I went to the Farmer's Market in the morning and the market in downtown Phoenix uses misters during the summer months to try to make if feel cooler. Combine misters with higher humidity and you create a fog so thick it's hard to see. And, it doesn't really make it feel cooler it just feels hot and wet. 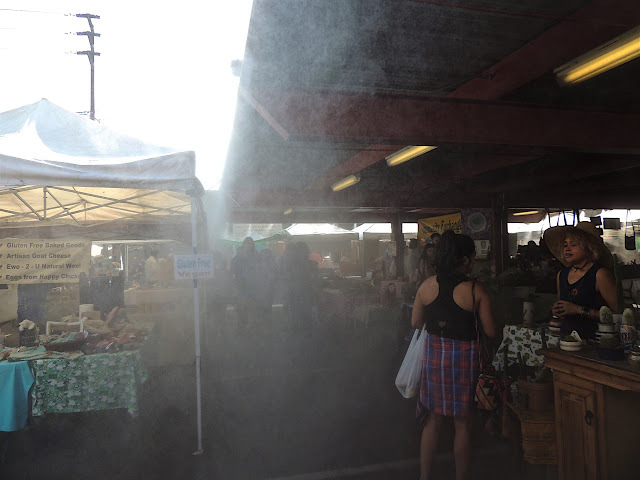 Fortunately I was only there long enough to pick up some bread and some tomatoes. 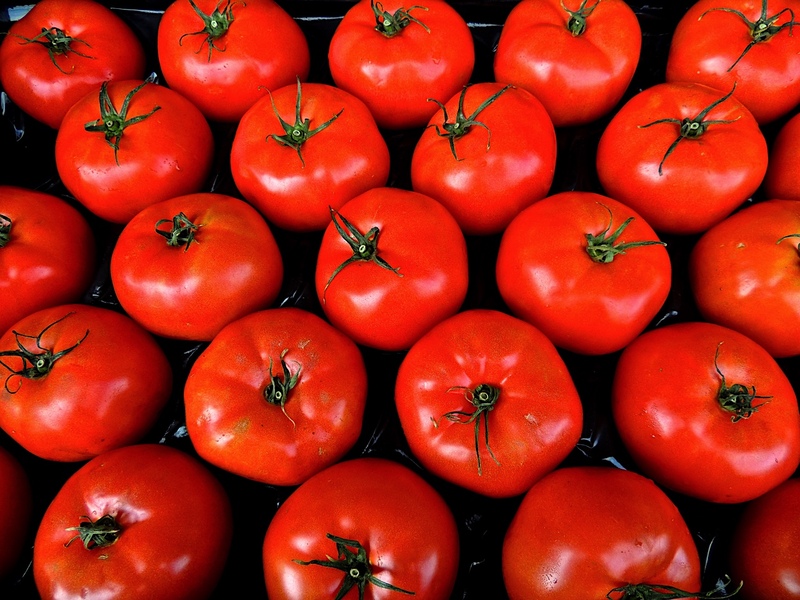 I did manage to take a photo of these perfectly red, perfectly shaped tomatoes displayed so neatly in perfect rows. These aren't the tomatoes I bought. My experience has been that the ones that are so perfect to look at usually don't taste all that great. There's a life lesson in there somewhere. Two weekends ago, I went out looking for murals in an area of town where I knew there would be many. However, this one stopped me in my tracks. It's on the side of a thrift store that caters to an immigrant population. I translated what it says off to the left side. It reads "Damn the soldier who points his weapon against his people." It's sort of heart-wrenching, don't you think? It's also sort of ironic that looming above is the view of a billboard advertising a military recruitment program. 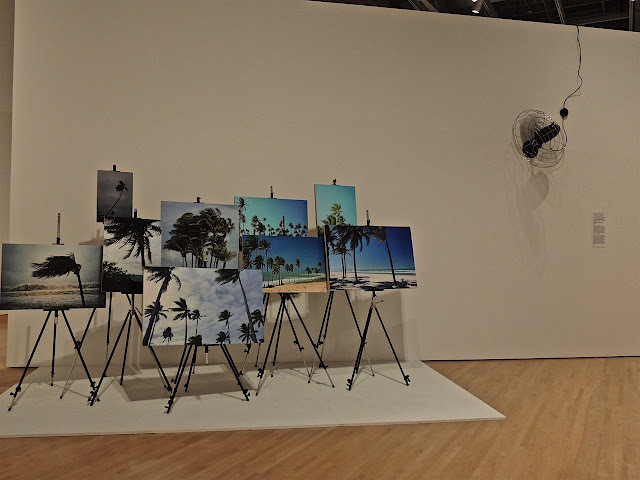 I had to come up with three new adjectives for todays post about the art exhibit I saw at the Phoenix Art Museum on Friday. 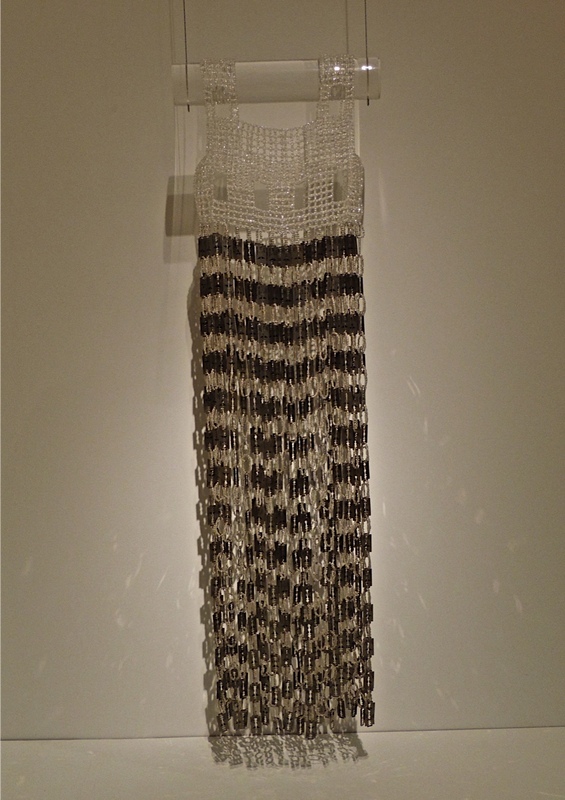 I have three other pieces from the exhibit today and once again, all by Brazilian artists. 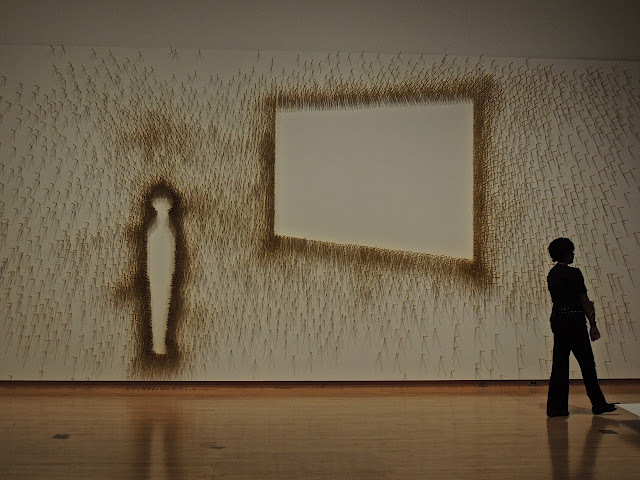 The one above is called "Curtain of Wind" by Rodrigo Matheus. It's composed of several photographs of palm trees blowing in the wind with a wall mounted fan blowing on them to add to the effect. It made me smile. 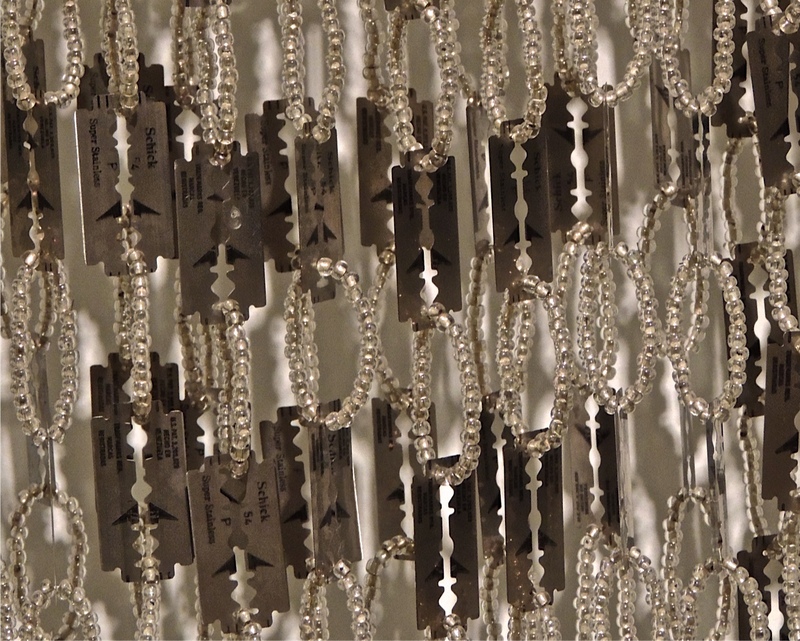 ...you will see that it's made of shiny razor blades! Pacheco was born with congenital physical deformities and had to undergo numerous surgeries to correct her appearance according to traditional paradigms of female beauty. 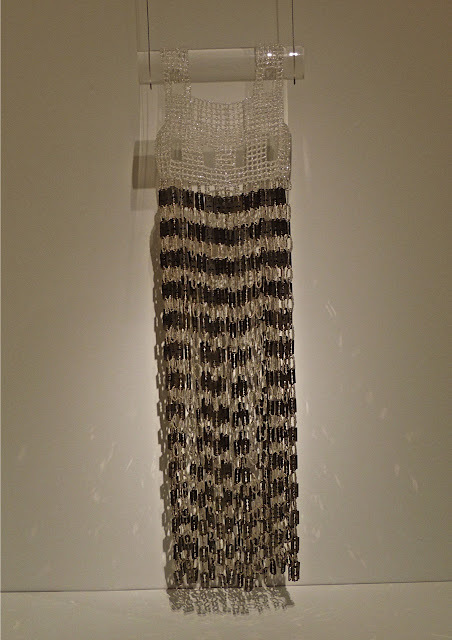 "Beyond the autobiographical, her works reference all of the aesthetic 'treatments' everyday women subject themselves to in order to approximate impossible ideals." Wow, now that is a pretty compelling statement. In this last piece you will see the form of a person at a museum looking at a work of art. 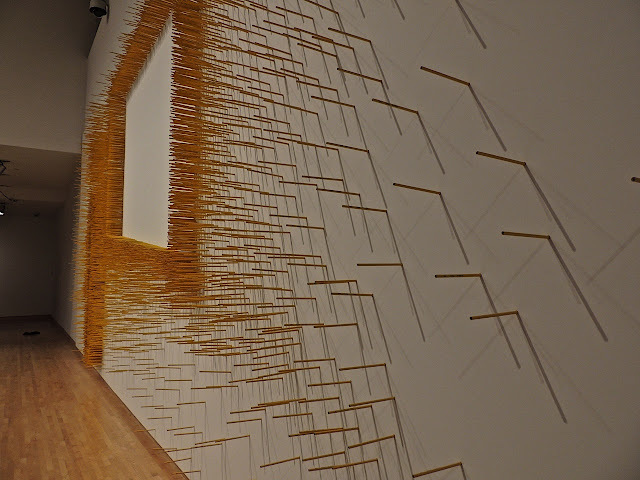 It's called "Note on a Lit Scene or Ten Thousand Pencils". You guessed it, it's made from ten thousand pencils positioned so they form a scene when viewed from far away. This one is by artist Jose Damasceno. As you can tell, this is a show that takes on many subjects and makes you think about what you are seeing. There is humor, irony and even a bit of madness there to be experienced.